20% du projet financé , MERCI à tous les premiers backers !!!!!! pour fêter ça, une petite carte dieux HERMES. 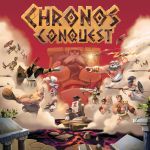 20% for Chronos conquest project, THANKS to all firsts backers !!! That's fantastic! Love the look of the staff! Looks like Hermes is looking over his shoulder to make sure everyone crossed the border. Great expression on the two characters! I love your rendition! Great character and expression! very professional! a lot to learn from you! I love your version of Hermes! It has a lot in common with my imagination of him. Très sympathique! J'aime bien ce graphisme! Dis moi, t'es-tu inspiré du Mercure de Pierre et Gilles?